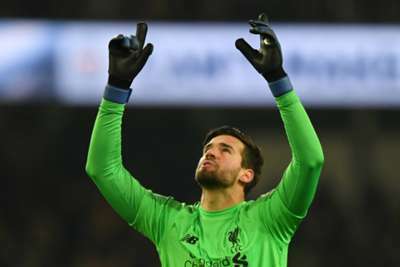 Alisson says he feels at home at Liverpool as the Brazil goalkeeper bids to help the club win their first title of the Premier League era. Top-of-the-table Liverpool are two points clear of defending champions Manchester City, who have a game in hand over the Reds. Alisson's arrival from Roma has been cited as one of the major reasons for the rise of Jurgen Klopp's side. But settling in at Anfield has not been straightforward for the 26-year-old, as he initially struggled to understand the Scouse accent, although the presence of compatriots Fabinho and Roberto Firmino has helped. "I have been having regular English lessons," Alisson told Liverpool's official club magazine. "One of the hardest challenges I had at the start was getting used to the accent, not just the British accent but the Liverpool accent! "But I've managed to deal with this. I can understand people and I can communicate with my team-mates, which is really important. "When I came here I felt that everyone was important for me, not just the Brazilians. Obviously Roberto Firmino was already here and then Fabinho arrived more or less the same time as I did. "Alisson's our goalie, the best there is around..."
"All the players are important, be they the local players from the UK or the players from overseas. I admire the strength we have as a team and the quality that every single one of our players has, but the most important thing for me is the team spirit. "Above all I feel at home here. Home is where the heart is and where the family is. My family is here, my daughter and my wife live here and my parents come when they can. My brother lives in Portugal, which is not too far, and comes when he can. That helps when I'm missing them. "When I think about Brazil, I miss it a lot but I have been welcomed here and I feel very much at home. The whole group received me very well. The fans have been very kind too, as have the technical team, so I'm really happy here in Liverpool." Liverpool return to Premier League action with a home game against top-four hopefuls Tottenham on Sunday.